The Sacramento News & Review this week included an insert from the City of Sacramento entitled Climate Change in Your Hands. If you haven’t seen it, I recommend it. I’m not sure if it was also in the Sacramento Bee, since I don’t read the Bee regularly. The insert is remarkably strong in its support of climate change, without any of the tea party denialism that shows up in so much of the printed and broadcast media. The graph at right shows the transportation element of greenhouse gas emissions for Sacramento, and it is the largest, at 48%. 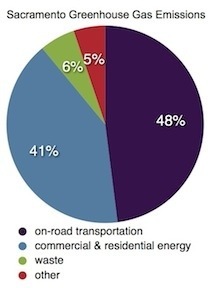 The city’s Climate Action Plan (at http://sacgp.org/cap.html) has a goal of reducing vehicles miles traveled (VMT) by 7% by 2012 and 16% by 2025. Both seem to me rather weak goals, but are nevertheless imperative as at least a starting point. “Cruising the green lane” on John “Bucky” Perez talks about his shift to biking rather than driving the five miles to work. He talks about the money savings, the health benefits, and that biking gets him energized in the morning and unwound at the end of the day. The “What can I do” sidebar list seven individual actions, including checking your Walk Score (which I posted about yesterday). The others are: 1) support sustainable land use initiatives; 2) think about moving; 4) try finding a job closer to home; 5) telecommute; 6) shift daily trips to walking, and 7) drive more efficiently. Each of these is worth exploring in more detail. These may seem like pretty big changes, particularly where you work and live, but think about that fact that most people these days change jobs a number of times and residences several times. Each of these changes is an opportunity to make a decision for sustainability.